Recently the LIKE ‘collective’ turned its attention to planning the autumn/winter season for the London Information & Knowledge Exchange. Looks like it’ll be exactly what we LIKE best – a programme of enjoyable and enlightening events. We ended our official summer sessions on a high, with Martin Belam’s: “Information Architects: The Secret Librarians of the Internet”. Martin talked of the varied roles and experiences that led to his present job as Lead User Experience & Information Architect at Guardian News & Media, then he told us about how he does that job (read more about the talk’s content on his blog. His hands-on, pragmatic approach to the role was inspiring. I guess you’d expect someone with “user experience” in their job title to be pretty focused on making the users’ experiences as fruitful and rewarding as possible, but expectations aren’t always fulfilled are they? ‘Guerilla usability testing’ helps keep his information architecture on track, as does his empathy for colleagues’ requirements and deadlines. What fascinated me most was how the Guardian’s content model relies for its success on tags. Having recently spent a few months implementing an Oracle WebCenter platform with Balfour Beatty WorkPlace I’d been immersed in content tagging (tags being one of the more pleasing aspects of WebCenter – a bit like delicious, but not as pretty), and was interested to hear how they manage tags and use them to create content relationships and cross-promotion of content. I love that the Guardian’s got a keyword guardian (tag manager, Peter Martin ). 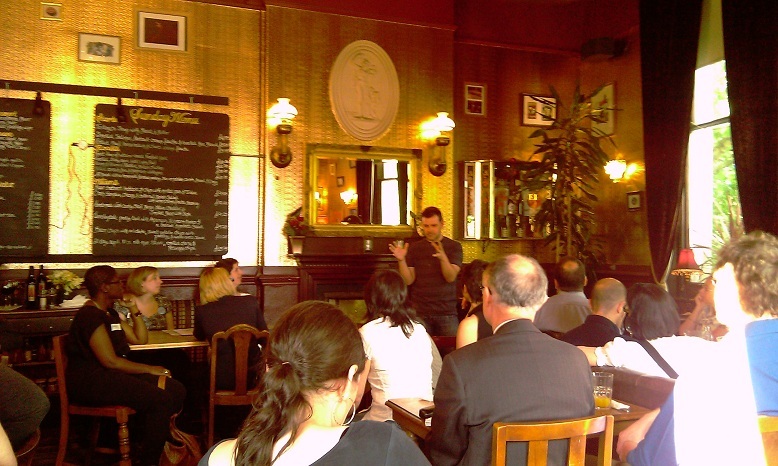 Informal LIKE summer meet-ups continue through August then, at the end of September, we’re back at The Crown for what promises to be a brilliant start to the autumn/winter season: ‘Connecting Information with Innovation’. John Davies will be exploring the findings and implications of TFPL’s recent survey of KIM roles and responsibilities. See you there perhaps?